After being guarded for three months, nine royal turtles—an endangered species found only in Cambodia—hatched in Koh Kong province this week and were taken to a nearby conservation center, an NGO said on Wednesday. 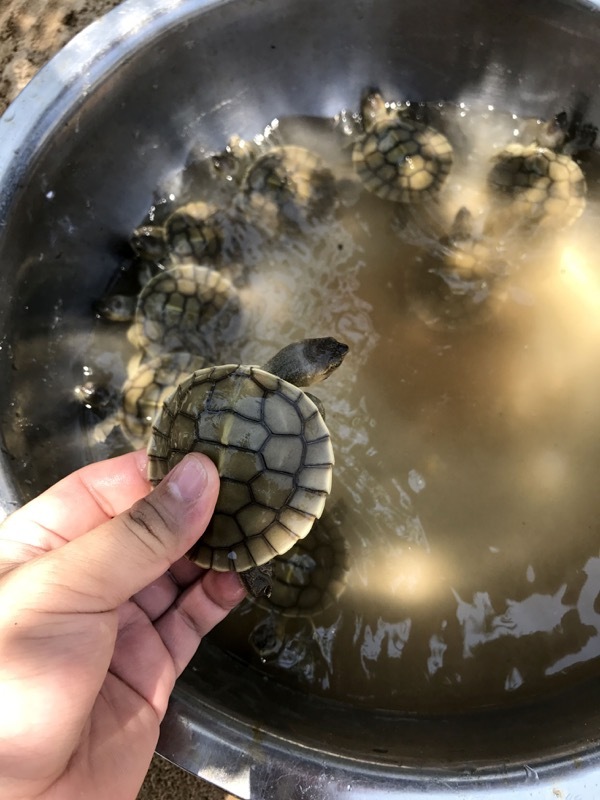 There are fewer than 10 royal turtles left in the wild, but the new hatchlings are among 216 being protected at the Koh Kong Reptile Conservation Center, said Eng Mengey, a communications officer for the Wildlife Conservation Society (WCS), in an email on Wednesday. After the nest was found along the Kaong River in Sre Ambel district’s Dang Pheng commune in February, four local villagers were hired to guard the eggs, Mr. Mengey said. An enclosure was built to protect the nest from predators, as well as to prevent the hatchlings from escaping when they emerged, he said. The turtles will be kept at the conservation center until they are between 5 and 10 years old, he added. “Hatchlings from protected nests are taken into [the] head-starting facility, where they are raised until [they are] many years old and therefore better able to survive in the wild once released,” he said. The project is being implemented in partnership with Wildlife Reserves Singapore. Discoveries of royal turtle nests are on the decline. Only two were found last year and three in 2015, a WCS news release said on Wednesday. “If sand dredging, illegal clearance of flooded forest and illegal fishing still continue, our national reptile species will face high risk of extinction,” Som Sitha, WCS’s technical adviser to the Sre Ambel Conservation Project, was quoted as saying. In February, an 11-year-old royal turtle was found dead in the Kaong River. Experts said the turtle was likely killed by electrofishing, which is banned in Cambodia.